The Association is funded by Membership subscriptions and charitable donations and is staffed by volunteers on an unpaid basis. Located in the Granton area of Edinburgh, adjacent to a gasworks site, Caroline Park was built in 1685 for Sir George Mackenzie, 1st Lord Tarbat (1630 – 1714) probably by architects Robert Mylne (1633 – 1710) and James Smith (c.1645 – 1731), but possibly with some input from Sir William Bruce (1630 – 1710). 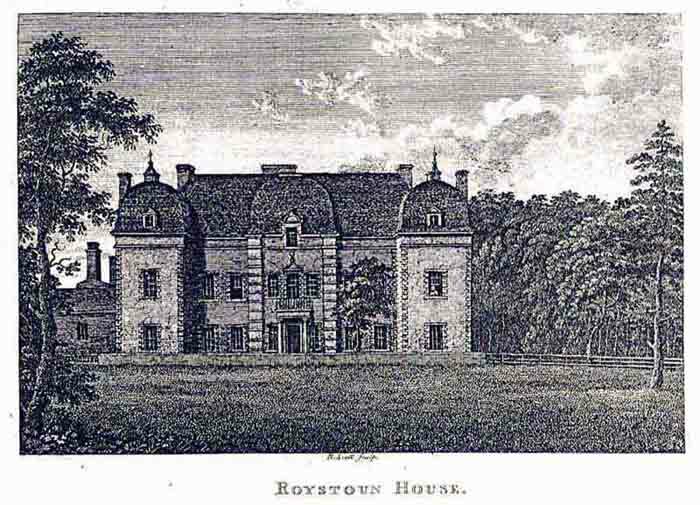 In 1683 Mackenzie bought the Barony of Royston which once boasted a castle, and quickly built what was originally known as Royston House, undoubtedly by diverting materials and labour from the reconstruction of the Palace of Holyroodhouse, with which the architects and Mackenzie were involved. A new garden-frontage in the French-baroque style was added in 1696 and William Adam(1689-1748), or perhaps his son John (1721-92), was responsible for a west range for the servants and kitchens added in the mid-18th Century. 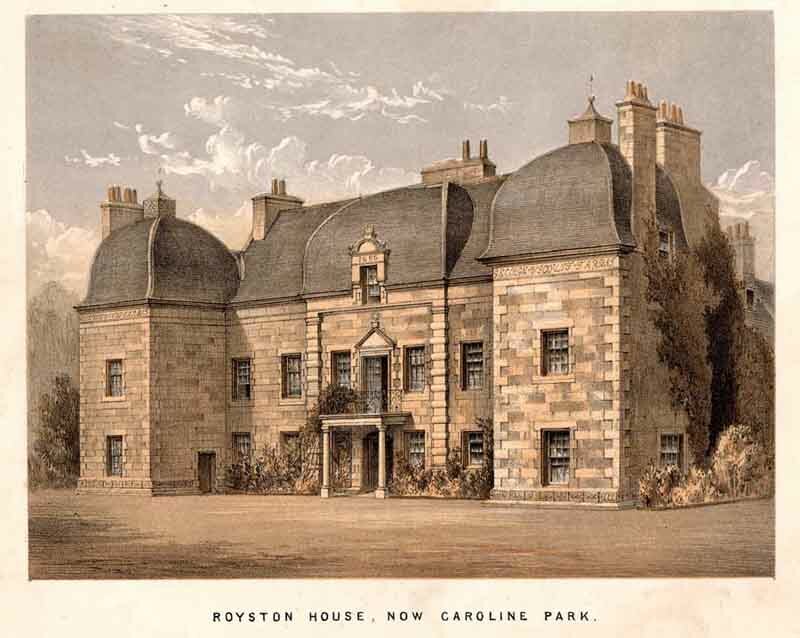 Having gained the necessary Act of Parliament, Mackenzie’s son, Lord Royston, sold the house in 1739 to John Campbell, the 2nd Duke of Argyll (1680 – 1743), who renamed it Caroline Park after his daughter, who married the Earl of Dalkeith. Through this marriage the house passed to the Dukes of Buccleuch. 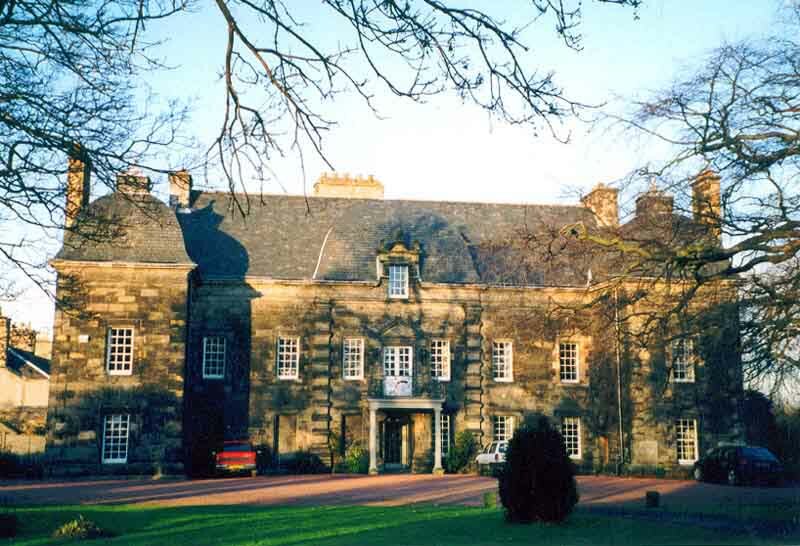 The Buccleuch’s had no shortage of houses, including Dalkeith Palace, not more than 9 miles (14 km) away to the south east, and thus Caroline Park was let to a succession of tenants, for the last 100 years or so the ink manufacturers A.B. Fleming and Co., who maintained the house in good order both inside and out. Today the house has a modest garden, its estates having been lost to the neighbouring developments, including Granton Gas-Works, which so completely dominates the area. However, internally the house still includes fine plaster-work ceilings by Italian craftsmen, a notable German iron-work balustrade, painted panels and woodcarving. Outside, its most notable feature is the fine slated balloon roof. 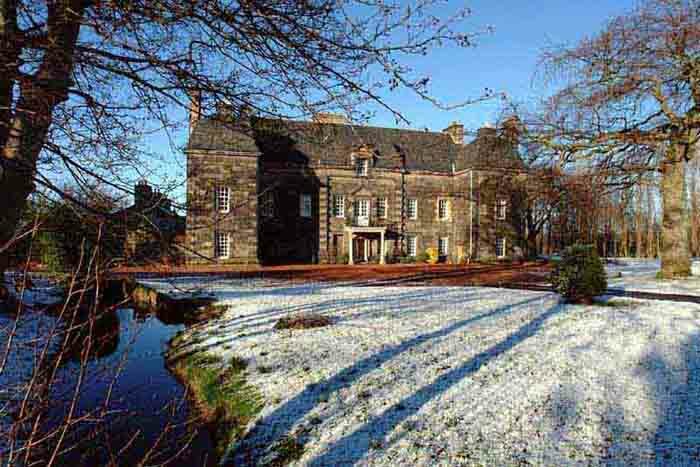 Sold by the Duke of Buccleuch in the late 1980s, the house has recently been restored to domestic use. Following the plans [bottom right] from Waterfront Edinburgh re their proposed enhancements to Caroline Park, Drew Parnell, current holder of the title deeds of Caroline Park, has expressed his concerns over their treatment of Caroline Park Avenue, a historic route presumably dating from the building of Wester Grantoun (Castle) in the 13th century. The following petition was signed by 28 Members of the European Parliamentduring their visit to Edinburgh last week following a visit to Caroline Park at the invitation of Struan Stevenson, MEP. It was also signed by David McLetchie, MSP, Ben Wallace, MSP, Sir Malcom Rifkind, Dermott Scott, Peter Scott and Susanne Tabbert. Thirty additional MEP’s have expressed a desire to add their signatures from Brussels where the petition is currently being circulated to them by StruanStevenson, MEP. 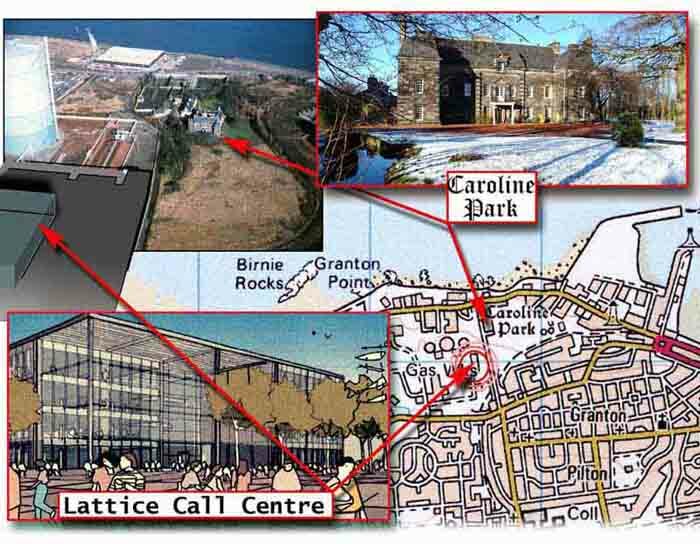 The Association, with these elected representatives, would urge the ScottishMinisters in their consideration of the Waterfront Edinburgh Ltd. planning applications on referral from Edinburgh City Council to consider an independent review of the proposed transport corridor and UpperStrand housing development which encircle and enclose Caroline Park to ensure that all steps that can reasonably be taken to preserve and protect Caroline Park and its setting within a successful development at Granton are indeed taken. The Association along with the Architectural Heritage Society of Scotland, the Cockburn Association and the Society for the Protection of Ancient Buildings have all called on the Scottish Ministers for an independent review through a public enquiry. We the undersigned support the efforts of those who believe that Caroline Park should be the key to any successful development of Edinburgh’s shoreline at Granton. The impact of the current development plans of Waterfront Edinburgh Ltd at Granton on 17th century Caroline Park – a Category A listed building (the same as the Palace of Holyroodhouse and parts of Edinburgh Castle) has generated comment from interested individuals of Scottish descent around the world. See two examples below. 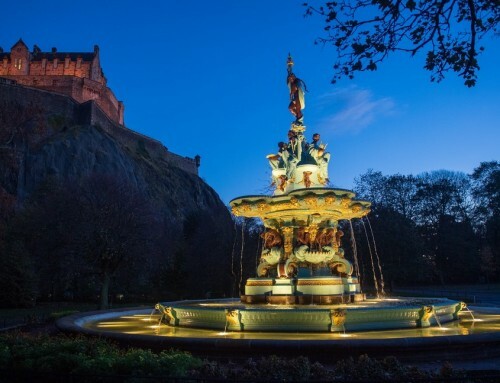 Scotland’s vital tourism industry is based on our preservation of our cultural heritage within our dynamic and creative 21st century society – both elements of which such Scots abroad return to appreciate and enjoy: past and present with a hint of the future. These letters argue for a sober second look at the impact of these plans on Caroline Park, an independent review, to ensure that all that can be done to protect and enhance Caroline Park and its setting is done within a successful overall development. 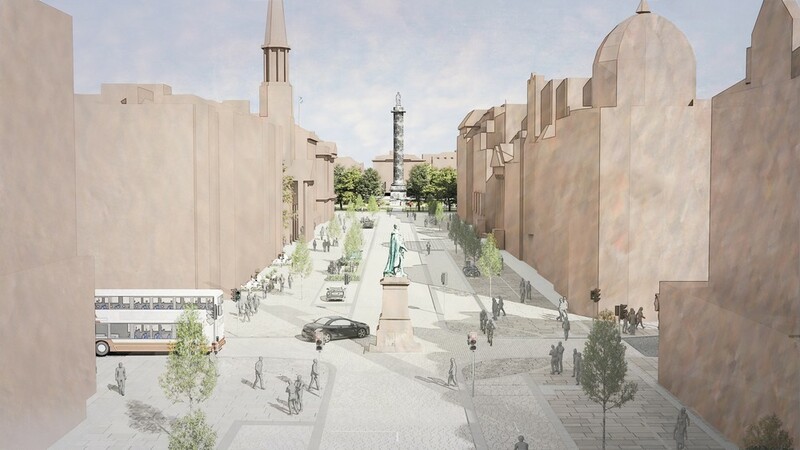 The Caroline Park Association agrees with that view and, along with the Architectural Heritage Society of Scotland, the Cockburn Association and the Society for the Protection of Ancient Buildings, has called for a an independent, public enquiry. It has come to our attention that there are plans to isolate the historic Caroline Park mansion in Edinburgh with the introduction of a road for a new waterfront development. 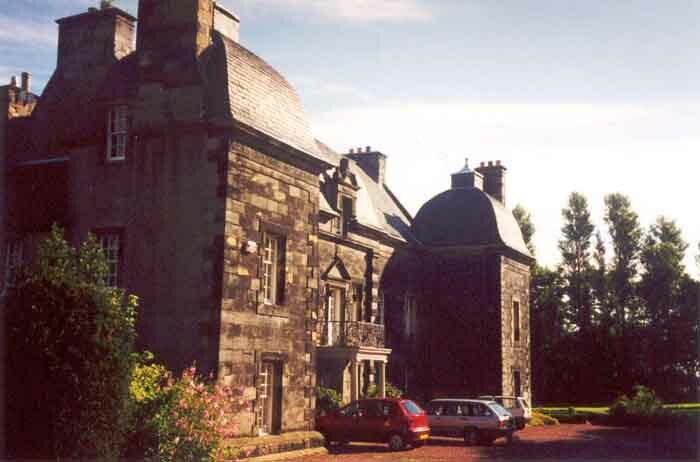 As part of Clan Mackenzie, many of whom are descendants from the original owner of this house, George Mackenzie, Viscount Tarbat, 1st Earl of Cromartie, Lord of Session, Lord Justice Clerk, Lord Register and Secretary of State for Scotland in his time, we feel there should be a second look at the planning of this development. We would hope that consideration will be made towards the protection and future historic development of the house and gardens in consideration of the generous and lifelong service the occupant gave to Scotland as a whole. Though we are now resident in the far corner of the world, those who return are always eager to visit the homes and areas of forebears. Scotland is a poignant reminder of our heritage and we appreciate the wonderful care that is taken of the historic sights by the organisations in charge. AS A Mackenzie descendant and a visitor to Scotland and Edinburgh, I would like to state my objection to the current planning for the Edinburgh waterfront development, wherein the access road would cut through the Caroline Park grounds and essentially destroy a shining example of important Scottish history. It would seem that a more suitable route for the road would be easy to develop. In all fairness, it would also seem that an objective, disinterested party should review the current planning and its impact on such history. Outline Planning Application at Land Known as the Central Development Area at Granton Waterfront, Edinburgh. Full Planning Application at Land Known as the Central Development Area at Granton Waterfront, Edinburgh. We understand that the subject applications have been referred to the Scottish Ministers by the Council of the City of Edinburgh and that you are the Scottish Minister responsible for such matters. Copies of this letter have been sent by post and E-mail to your Ministerial colleagues and to the responsible civil servants. Caroline Park is a unique 17th century architectural masterpiece – a Category A listed building that is under threat from the developments contemplated in the subject applications at the Granton Waterfront, a threat that could be eliminated by minor changes in the overall plans at limited expense and thereby provide Caroline Park with an appropriate and sustainable setting for the future. 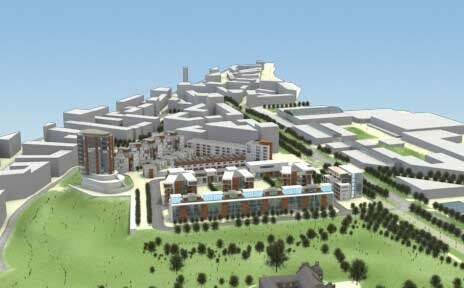 The Association supports the overall Granton Waterfront development envisaged by Waterfront Edinburgh in its plan: multi use development sensitive to the historical landscape and the vistas over the Forth with Caroline Park in its appropriate countryside / parkland setting as its central focus. The transportation corridor (spine road / LRT / cycle & pedestrian ways) intrudes on the curtilage and adversely affects the setting of Caroline Park. The transportation corridor proposed is 40 metres wide and approaches Caroline Park head on from the south on its principal axis to within 100 metres of its front door. The corridor intrudes on the curtilage of Caroline Park as it was at the date of its Category A listing in July 1966 thus requiring listed building consent for which no application has been made. The corridor follows an “S” bend profile : two right angle bends within 120 metres which in transportation planning terms is most irregular except when required by terrain constraints. The corridor if built will necessitate the screening Caroline Park by means of a tall wall or hedge blocking forever the public view of Caroline Park, its setting and the Firth of Forth beyond. Reversion to the approved Master Plan spine road route at minor additional cost would result in the protection and preservation of the setting and curtilage of Caroline Park. The Upper Strand Tenement development of five stories 100 metres to the East will result in a serious adverse effect on the setting of Caroline Park. The Upper Strand is the prime residential development within the Granton development area. It comprises 800 tenement units in a “New Town” layout with its western frontage 100 metres from the eastern wall of Caroline Park house. The Upper Strand development at five stories and so close to Caroline Park will dwarf and dominate the house and all but eliminate its setting no matter how architecturally sensitive the final design. The Upper Strand development site if rotated 45% to the east which can be accomplished at marginal additional cost with the realignment of the transportation corridor would have significantly less impact on the setting of Caroline Park and would open up public vistas across the Firth of Forth incorporating the beauty of Caroline Park and its setting for all to enjoy. A “cordon sanitaire” should be established around Caroline Park to the south and east which would preserve and protect its setting and the views across the Forth for all to enjoy. This can be achieved at marginal cost by rotating the Upper Strand by 45% to the east and realigning the transportation corridor to the Master Plan route. Unless these elements of the development are appropriately modified, which can be done through minor changes at marginal additional cost, the proposed development will seriously compromise the unique characteristics and heritage value of Caroline Park, protected by statute, and will result in the irreversible and irrecoverable degradation this national heritage treasure which has survived for over 235 years. The Association in light of the threat to this national treasure inherent in the approval of the subject applications would request that the Scottish Ministers “call in” those applications for determination and hold a public enquiry with respect thereto as part of such determination. 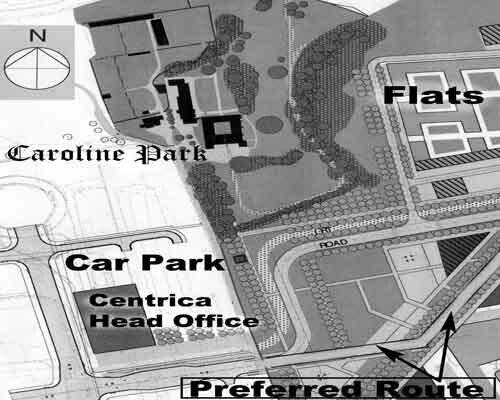 The Association makes this request reluctantly as the only option available at present, outside of formal legal proceedings, to ensure that those minor changes as are necessary to ensure the protection and preservation of Caroline Park and its setting for this and subsequent generations are made in the development proposals contained in the subject applications before they receive final approval. 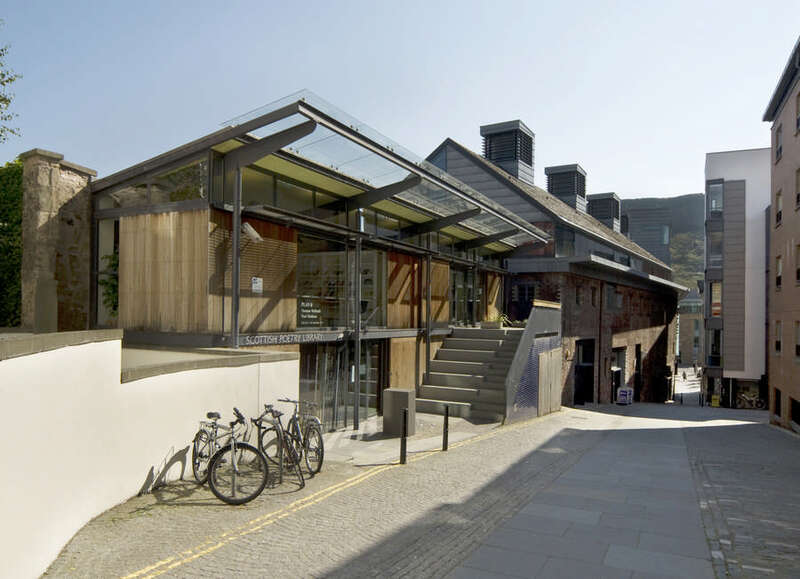 The Association bases this request in addition on the substantial and material errors in fact and law in the reports by the City of Edinburgh Planning Department to the Council Planning Committee on these applications on which the decisions of the Planning Committee were based. The Association has identified these errors in fact and law in its submissions to the Planning department and to the members of the Planning Committee which are before you and form part of the record of these applications. A further ground for this request concerns the inherent flaws in the processing of these applications which involve non arms length relationships of a material nature between the applicant, the Council of the City of Edinburgh, owner of 50% of the applicant, and Historic Scotland, a specialist agency with statutory responsibilities in planning matters involving listed buildings which reports to the Scottish Executive, the owner of the other 50% of the applicant – relationships which give rise to legitimate concerns over potential conflict of interest on material matters which were not balanced by independent, arms length expert opinion despite requests therefor made by the Association. An additional reason for independent review through a public enquiry was the failure by the City Planning department to consider numerous submissions made by this Association and others after the advertised deadline on the Detailed (FUL) application – so submitted with the prior agreement of the responsible officials within the Planning department that they would be considered. Another reason is the refusal of the Planning department to consider issues of access along Caroline Park Avenue. These and other reasons are presented in detail in Association submissions on the record before you. The Association further believes that two essential ingredients are missing from the multi use profile of the development. 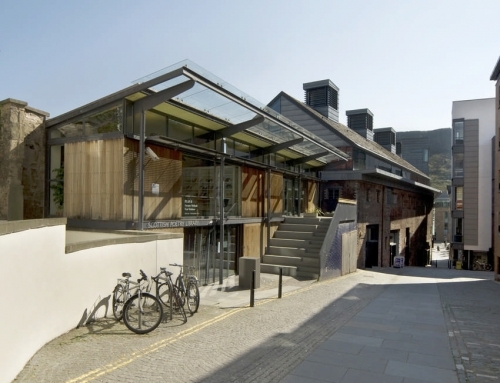 One is culture and the Association has put forward for public discussion a plan for a world class European Art and Culture centre celebrating Scotland in Europe in art and culture in the form of a series of small landscape sensitive pavilions flowing down the Granton escarpment to the sea within the “cordon sanitaire” along the lines of the Louisiana Gallery in Copenhagen with a tie in to a sculpture trail on the proposed LRT line and to the art and culture plans for the Leith/Newhaven/Granton developments by Forth Ports. The other missing element is a framework for environmentally aware planning: energy efficient and ecologically sensitive construction, public transportation initiatives and green space/belt enhancement. The Association would urge the Scottish Ministers as part of its determination of these applications to commission independent, expert opinion on those matters on which it would normally look to Historic Scotland for advice in light of non arms length relationship and the potential conflict of interest created by the fact that the Scottish Executive through SE E&L owns 50% of the applicant and that Historic Scotland also reports to the Scottish Executive. The Association is of the view that this action is appropriate in this case in an abundance of caution to guarantee openness and transparency in the decision making process and provide concrete assurances that the eventual decision reached is based on full and fair consideration of the facts adduced and presented on an arms length basis. A recommendation as to how future developments within the Granton Waterfront Master Plan area should treat Caroline Park and its setting to enhance its situation. The Association would urge the Scottish Ministers in their call for a public enquiry to take note of the costs of proper representation in such an enquiry and to the disparity of resources as between the applicant, in which it has an interest, and other interested parties including the Association and the owners of Caroline Park and would request the Scottish Ministers to make an allocation of financial resources to those parties to ensure that the public enquiry will have the benefit of the best advice possible through complete and thorough professional representation on both sides. In conclusion, the Association believes that there are issues of substance and process at issue with respect to the consideration of the subject applications by the Scottish Ministers on referral that are sufficiently material to require the call in of those applications by the Scottish Ministers for determination by them fin a process incorporating a public enquiry to ensure an independent, arms length presentation of the facts and similar expert opinion on the legal and national heritage issues central to any decision on these applications. Your due consideration of our position in your determination of these applications on referral is appreciated. RETROSPECTIVE : Erection of a “Temporary” 6’ Concrete Post – Chain Link fence topped with three strands of barbed wire adjacent to the southern property line of Caroline Park, a Category A listed building. This is the submission of the Caroline Park Association with respect to the subject application by Waterfront Edinburgh Limited for retrospective planning permission to erect a 6’ high “Temporary” concrete post – chain link fence topped with three strands of barbed wire adjacent to the southern property line of Caroline Park, a Category A Listed building. 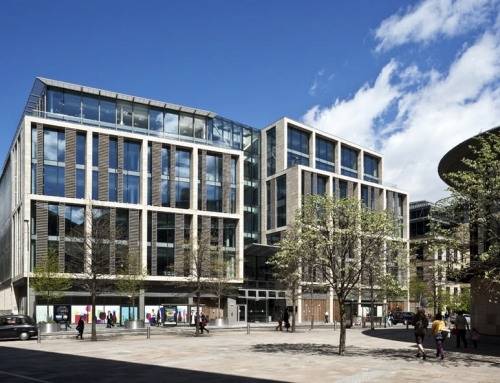 The applicant, Waterfront Edinburgh Limited, is a private corporation engaged in the land development business for private commercial purposes. 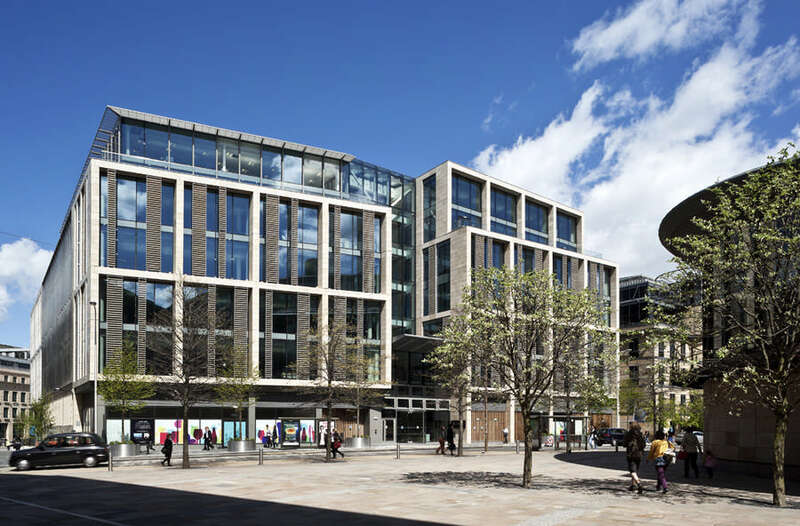 It is owned in equal degree by the City of Edinburgh, the Planning authority in this application and Scottish Enterprise Edinburgh & Lothians, itself owned by the Scottish Executive, the appellate authority with respect to this application. The applicant was found guilty of an offence in terms of the Building (Scotland) Act 1959 & 1970 in April of this year by the Regulatory Committee of Council (Ref Regulatory Committee Minutes 10/04/2002 Item 4) with respect to the unauthorised demolition of the Caroline Bingo Hall on Caroline Park Avenue. The applicant was found “in breach of planning control” in October 2002 by the Enforcement Division of City Planning (Ref. I.D. Williams – Enforcement Officer 0131 529 3752) with respect to the unauthorised erection of the fence that is the subject of the instant retrospective planning application – a barbed wire topped, six foot tall chain link fence along the southern property line of Caroline Park. Caroline Park is a Category A listed building, protected by statute along with its setting, a fact known to the applicant. These past violations by the applicant should cause the Planning Department to place the applicant under enhanced scrutiny in the future given the fact that these and other already approved developments by the applicant are proposed immediately adjacent to an important Category A listed building. The question as to whether the applicant had the required planning approvals to proceed with the erection of the fence, whose actual erection is the subject of this retrospective planning application, was asked of the senior management of the applicant by the owners of Caroline Park prior to the erection of the fence. Not satisfied with the applicant’s general assertion that the necessary approvals were in hand, the proprietor of Caroline Park enquired of the Planning Department whether such permission was required and what were the remedies should construction be commenced without permission. 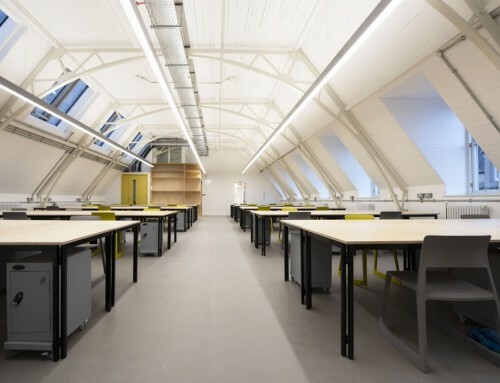 The Planning Department answer was that without specifics (the plans being held by the applicant) it was impossible to provide an answer but that once construction commenced the Enforcement Office could be asked to look into the matter. Historic Scotland was similarly advised by the Association and declined to investigate on the basis that this was a matter for the civic authorities and that it was available to assist them only if so requested. The City Planning enforcement office was so asked once construction had been commenced and determined that the applicant was in breach of planning control. situation – a factor that no doubt had entered into the calculation of the applicant. The applicant in this way succeeded in erecting its fence without the required planning permission or the ability of the public or statutory bodies to comment on its plans as is permitted / mandated by the planning laws. The facts of the matter are that the applicant, a commercial developer expected to know the planning laws (although with a prior record of breaching those laws), was questioned as to whether it had the requisite authority to erect this fence and chose to do so without such permission – for which it now makes application in retrospect – with no evidence of contrition on the public planning record. The applicant is aware of the fact that Caroline Park is a Category A listed building which, along with its setting is protected by statute, yet, so far as we are aware, it proceeded with the erection of the fence for which approval is now sought, without reference to Historic Scotland or other bodies charged with the protection and enhancement of listed buildings and our cultural heritage. The actions of the applicant in light of the foregoing, unless there are facts of which we are not aware, present compelling evidence of a high handed, almost arrogant disregard not only for the requirements of the planning laws but also the requirement to seek qualified opinion on matters involving the protection and enhancement of our cultural heritage – also mandated by law. The Planning Department would, in the view of the Association, be well advised to bear this in mind in future dealings with the applicant. It is difficult to comment on this retrospective application – the “Temporary” fence that is the subject of the application having already been erected. The applicant describes the fence as ‘temporary’ – yet its construction in concrete, chain link and barbed wire belies this assertion. The construction is significantly more ‘permanent’ than the other ‘permanent’ fences in the area. The fence separates the applicants property from that of Caroline Park – a private residence – yet it is topped with three strands of barbed wire angled towards Caroline Park. A six foot concrete post chain link, barbed wire topped fence to keep the residents of Caroline Park off the applicant’s property (its purpose since the rest of the applicant’s property is fenced) seems somewhat excessive. Caroline Park is a Category A listed building. The Association is of the opinion that the fence proposed is not of a character suitable to its location adjacent to a Category a listed building and that a less intrusive fence of a design more in keeping with the design of a 17th Century house of substantial architectural, historical and cultural significance would be more appropriate. 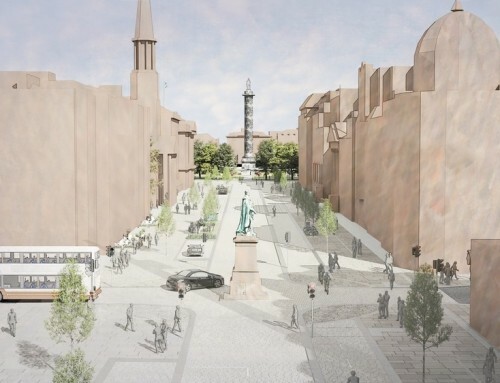 The Association is not aware whether Historic Scotland has been consulted on this application or the Royal Fine Arts Commission and other such cultural bodies with a statutory say in the planning process but feels their input is required. If it is suggested that such consultation is not required because the proposed fence is temporary in nature, the Association would point to the physical characteristics of the fence and its construction (none of which are temporary) and to the past violations of planning laws by the applicant as requiring an excess of caution on the part of the planning authorities to ensure that approval of the fence is not made to a lower standard solely on the assertion of the applicant that it is temporary. The Association would in conclusion submit that the past record of the applicant coupled with its actions in the instant case should cause the Planning Department and the Planning Committee to request both a formal apology from the applicant for its actions in this case and an assurance from the applicant that it will take concrete steps to ensure that all planning requirements are met in future – perhaps the appointment of an internal planning compliance officer could be considered / mandated. The applicant in this retrospective application asserts that the fence is temporary. If the Planning Committee sees fit to accept the applicant’s apparently deliberate circumvention of legal planning requirements in this case by granting this application, the Association would submit that a time limit be imposed to ensure that temporary indeed means temporary. The Association would suggest a further condition that the applicant be required secure the agreement of Historic Scotland in advance of any future application for a permanent replacement fence.